Mmmmm….. Hummus. I love you, so. Sadly, raw garbanzo beans, even sprouted ones, just don’t do it for me. Believe me. I’ve tried. But raw peas? My mouth is happy to dance with a big ol’ bowl of raw peas, especially if they’re whizzed up with tahini, lemon, garlic and olive oil. Place all ingredients in the bowl of a food processor and process until mostly smooth. If needed, add a bit of water until you get the hummus consistency that you like. For more seasonal recipes, check out Seasonal Sundays. For some real food, check out Real Food Wednesdays. Have you seen Ricki’s new link up – Summer Wellness Weekends? I just found it and it’s sure to be a regular weekend stop for me. Check it out! This entry was posted in grain-free, nightshade-free, nut-free, raw and tagged gluten-free, grain-free, hummus, raw, recipes, vegan. Bookmark the permalink. I love green pea hummus with some mint or lavender leaves mixed in. It’s yummy. I’ve never really gotten into mint or lavender much. One of these days, I should give them a try again. I love peas and basil, though. I bet a pea, basil, lime juice version would be delicious. I’ve been putting garlic scapes in everything raw. They’re less powerful than regular garlic. I only use from the base to the bottom of the flower bulge though. From there up they seem to “green” tasty and not enough “garlic” tasting. Well, I do love a good pea, and you haven’t led me wrong with a recipe yet, so this is definitely going on the to-make list! I’ve never seen garlic scapes, but I’m also not sure I’ve looked for them. Are they at regular grocery stores, or will I need somewhere more Whole Foods-style? Whole Foodsy or farmer’s market, most likely. But, you can get by with using regular garlic. I’ve gotten scapes in my CSA box the last 2 weeks – so I’m using them in everything to use them up before they go bad. They’re milder than the bulbs. Super yummy without the bite. I like the sound of it! I have a farmer’s market trip planned for this weekend, so I’ll check there first. Sounds so good right now! I have peas growing in my garden I think I might be making this soon! thanks for sharing! You’re welcome, Kathryn. I hope you do try it and enjoy it! This looks so yummy and creamy…I can’t wait to try it! Fresh peas are a favorite of mine. Thanks Ricki. I actually ate some cooked food yesterday. I found myself really craving protein and eating too many nuts in an effort to compensate. So, I made some traditional hummus and then realized I like the pea version better, though it DID do the trick for making me feel satiated. Ah well. Live and learn. I think this grain-free thing I’m doing while doing raw is really great for me. But, I think I still need to add in more beans and some cooked veggies for variety, as there are some I’m just not liking all the much in raw form. It’s all a learning process, right? This looks great! I’m doing the Mccombs candidia diet (http://www.mccombsplan.com/), only just starting and am looking for topping to put on rice cakes as I’m not allowed beans, nuts, seeds, etc. I’m thinking you can make this without the tahani? Is there something i should add in it’s place or no? Hm… the tahine definitely makes it more creamy and more savory. The peas alone are almost sweet. (Though that might be good on rice cakes.) I’m not sure what else would work, though, if all beans, nuts, and seeds are out. Oh wait – avocado! Can you have that? The color of this hummus is so pretty. I love peas and it sounds really good. I’ll have to try it. Thanks JoLynn. This is one of those recipes that I can’t get enough of. I’ve made it two more times since posting and I’m making it again today! So quick, easy and yummy. I made this hummus today (forgot the garlic though) and it’s absolutely pretty and delicious. Would like to post the recipe on my blog with link back to you of course, if you don’t mind. Please let me know. Of course! It’d be great if you take your own pictures (so people know you actually made it). But, as long as you link back to me, I’m happy to share the recipe. So glad you liked it. Hi! I pickled all my scapes! Do you suppose a pickled scape would work well in this recipe? I featured your Parsnips Paté at a recipe sampling and it was very well received. Thank you for sharing. I love the simplicity of these recipes. 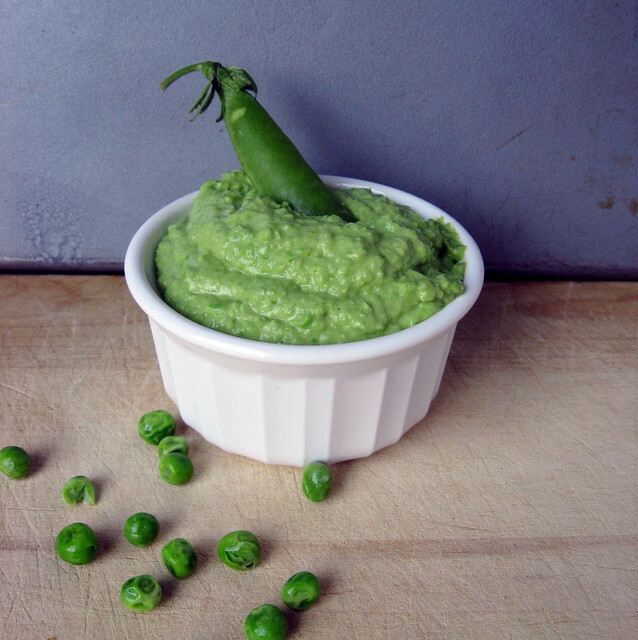 Sampled your Green Pea Hummus and it was a big hit! Been invited to do the samplings at the Ladies Spring Tea and the hummus was among the recipes requested. Did use a pickled scape and that was good – milder than the clove. Also added cumin & flat leaf parsley (found while searching for this recipe) and that was good also. Thank you for all your wonderful experiments! Guess maybe we’re the beneficiaries! So glad you liked it! I always love hearing that someone took the time to make one of my recipes. Even better that you liked it! Is it normal that it has a bitter note at the end ? Hm… Mine did not. It could be the quality of the peas. Eat a pea plain. Does it have a bitter note? If so, you could combat it by adding a touch of raw honey (or if vegan, you could do a touch of coconut nectar). You’d want to be very cautious, though. A little sweet in this would go a long way.